Social Media in the Middle East – Intrusive or expected? For the last three years marketing departments all over the world have been shouting about harnessing the power of social media. But is it right that business invades social interactions online? Does the Facebook account of a young businessman in Dubai need the intrusion of a local bakery touting their latest offer? Well, according to a recent study by the Dubai School of Government, that’s exactly what entrepreneurs in the region want to happen. From a poll of 5,000 young people from throughout the Middle East, 86% believed social media would empower entrepreneurs with branding and marketing. Another 86% believed it would help them tap into wider markets. So social media has been fully embraced as a strong marketing tool. But is this view mirrored by the users of social media? According to a report by Bayt (a recruitment company), over 47% of people polled in the Middle East say they actively follow business social media vehicles (other than the social media from the company they currently work for). And the top brands being followed? Well unsurprisingly N2V, the internet company, tops the Facebook chart with over 260,000 fans, followed by The Dubai Mall’s Facebook page. But liking a page isn’t the same as actively engaging with a company’s social media. Air Arabia can only be applauded for with their efforts in building a engagement rate of 0.31%. These results show that people in the Middle East are as happy as the rest of the world to get involved with their favourite brands through social media. 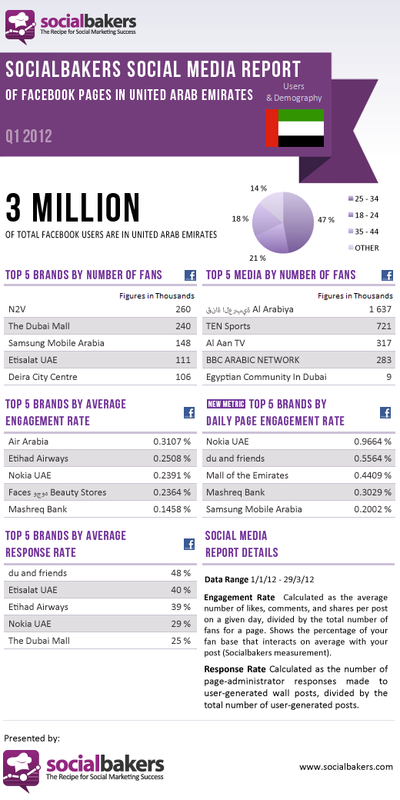 Social media is growing rapidly in the Middle East. 88% of the Middle East’s online population uses social media sites on a daily basis. Which is over a third of the population of the whole of the Middle East. Although numbers cannot be exact (as they are growing every day), a survey early in 2013 put Facebook, Twitter and LinkedIn firmly at the top of the social media tree. Facebook users were 58 million, Twitter 6.5 million, and LinkedIn 5.8 million. However, in the UAE LinkedIn outstrips Twitter, where 12% of people use LinkedIn, Twitter gets a paltry 3%. This could be down to the more professional focus seen in professionals in the region. Something that is backed up by another survey by Bayt. In the whole of Mena, 9 out of 10 professionals said they’d gone online to search for people they had either met, or were going to meet, while 8 in 10 said they’d googled themselves: proving the UAE professional is obviously very internet savvy. With nearly a third of professionals admitting to spending more than five hours a day online, the internet has penetrated both business and private lives of people living in the Middle East. For marketeers this shows there is a real appetite for online content. As people rely more and more on social media to find great content, it is not a case of whether businesses should be engaging people through social media, It’s more a case of businesses becoming more creative in finding the best strategies to engage people. Did this campaign bring out the artist in you? An example of this was Bank Audi’s ‘Card Artist’ social media campaign. The bank encouraged people to completely personalise their credit cards, then post a picture of it on the bank’s Facebook page to possibly win a cash prize. It took just a few days for Bank Audi’s Facebook page to gain 2,000 fans. As a consequence of their hard work on their social media, Bank Audi won the 2012 Middle East Internet award for Best Social Media Campaign in the Financial Services category. Whether your customers are in Dubai, Abu Dhabi, Riyadh, Muscat, further afield, or closer to home, using social media cleverly is not only welcomed by social media users in the Middle East, they can become active participants in building your brand online.